Early morning light in Tuscany. A hilly, fertile region in central Italy, Tuscany was the home of the Etruscan civilization, and later the birthplace of the Renaissance. It’s known for its picturesque landscapes and charming, historic towns like Siena, Arezzo, Cortona, Lucca, San Gimignano, and Volterra. It’s also renowned for its bold red wines and fruity extra virgin olive oils. Tuscany’s capital, Florence, is a great art center whose well-preserved centro storico remains closely linked to its medieval past, in spite of year round tourist crowds. The region’s Tyrrhenian coast is famous for its white sand beaches and pine forests. Come August, Florentines depart en masse for spots such as Viareggio, Camaiore, Forte dei Marmi, and the island of Elba. 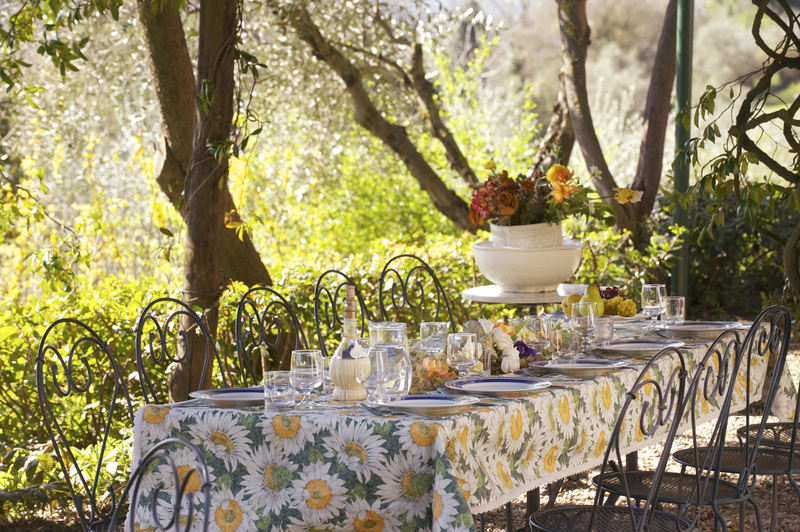 The table is set for lunch at Villa del Cielo, near Siena. Meet your local contact at the villa. Familiarize yourself with the property, ask for restaurant recommendations, the closest grocery store, and whether there are any special events happen­ing during your stay! Most stores will be closed on Sunday, so shop for any supplies you’ll need before Monday morning. Sunday is a day of rest for most Italians, so relax at your villa. Head into town for a casual lunch at a trattoria; in the late afternoon, join the locals in la passeggiata, a leisurely stroll along the main street. Explore the hill towns in Tuscany! Depending on your location in the region, visit a notable hill town such as San Gimignano, Volterra, Cortona, Montepulciano, or Mon­talcino. Spend all day in one spot or drive to another town after lunch. In the evening, return to your villa for a simple meal of pasta topped with chopped tomatoes, basil, garlic and a splash of extra virgin olive oil. Add a green salad and a bottle of local red. 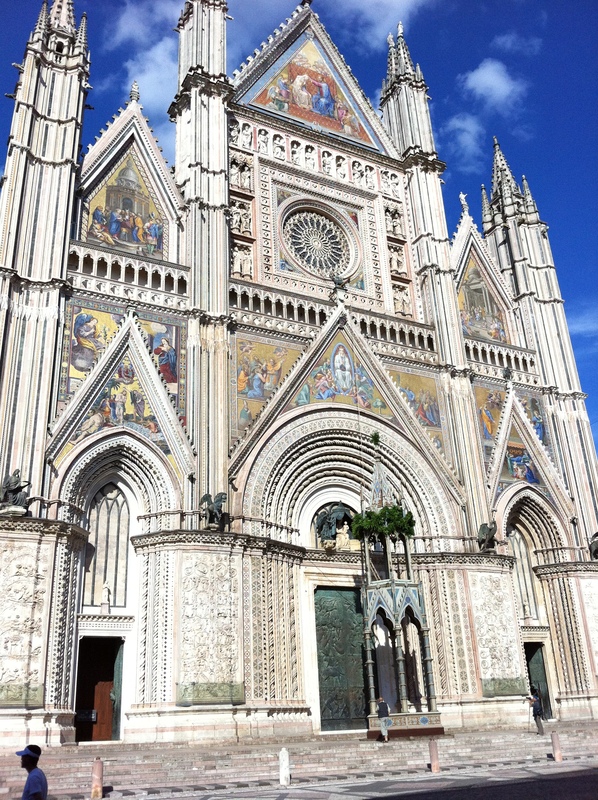 Spend the day in Florence, Siena, or Lucca. Visit museums, investigate churches, and shop for local crafts. Enjoy a leisurely lunch in the shade at an outdoor café or trattoria. Return home before dark so you can stop at a local rosticceria or tavola calda for delicious take-out. 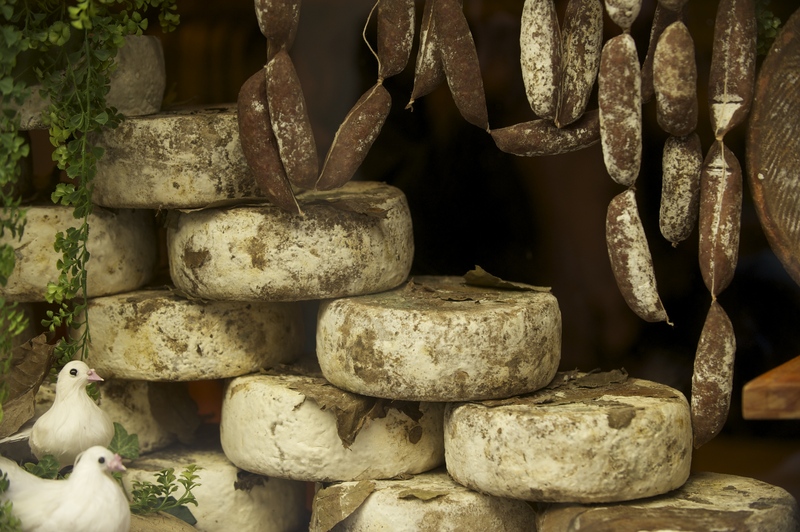 Shop for local salumi and cheeses–perfect for a simple supper at the villa! Sleep in; then eat breakfast Italian-style by visiting a bar and ordering un cappuccino e cornetto (a cappuccino and a croissant). Afterward, head to class! Cooking, painting, olive oil tasting, or perhaps a visit to a farmer’s market to practice your Italian – whatever your interest, take some time to learn something new. If you’re planning ahead, this is a great evening to have a chef come and prepare a gourmet Tuscan dinner for your entire group. Tasting wine in Tuscany–a great day trip during your villa rental week! Head out to a hill town you haven’t yet explored. Hand-painted ceramics, linens, and leather goods make great gifts and souvenirs. With dinner in mind, keep your eyes open for a salume­ria, where you will find cured meats such as salami, prosciutto, and bresaola. Don’t forget the marinated artichokes and roasted eggplant! Enjoy the pool at your villa! Spend your last full day sunning by the pool, catching up on your travel journal, and reliving the week’s adventures with your companions. In the late afternoon, pack your bags and treat yourselves to dinner in a local restaurant. 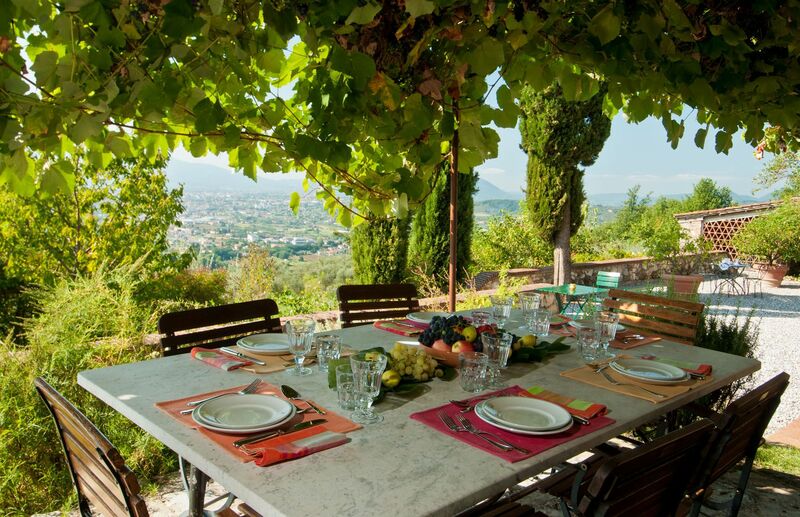 Enjoy a culinary tour and wine tasting during your villa rental week! 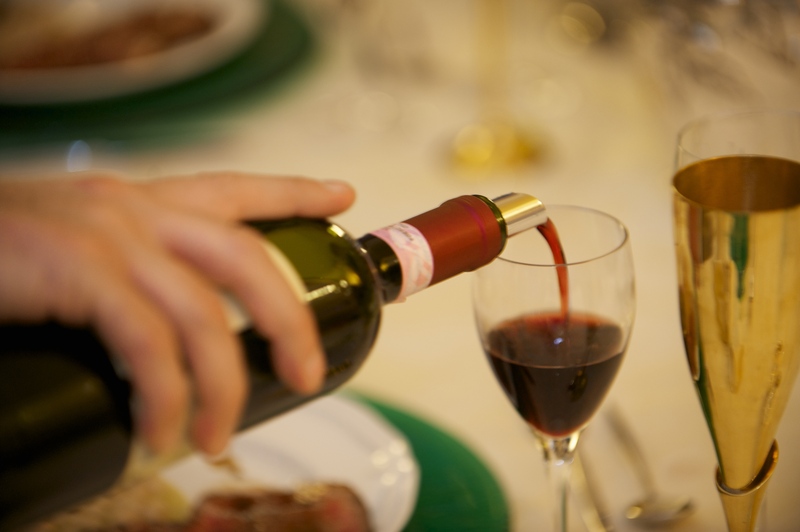 Booking a food and wine experience during your villa stay is a fun, enriching way to truly savor life in Tuscany. Explore the San Lorenzo market with a local guide! Overview: Acquaint yourself with the heart and soul of Tuscan cuisine by visiting Florence’s famous open air markets: Mercato Centrale di San Lorenzo and Mercato di Sant’Ambrogio. Your tour includes transportation, a guided walk through the historic center, and lunch. Meet your guide at the Mercato Centrale di San Lorenzo or, if you’re staying at a villa within a 30 km radius of Florence, enjoy pick up at your door. Your food experience begins on the newly renovated upstairs level of the market, which has multiple artisan food courts featuring fresh and prepared foods, including seafood, meat (salumi and offal included), pasta, cheese, and bread. Your expert local guide, a language student at Florence University, will introduce you to the very best of Italian cuisine! Next, enjoy a stroll through the historic center of Florence as you make your way to Sant’Ambrogio, the market that is most popular with locals, not tourists. Your guide will educate you on local history and architecture along the way. Tour the Sant’Ambrogio market and then sit down to a typical Florentine lunch with the locals in the market trattoria (meal includes vino della casa–house wine). 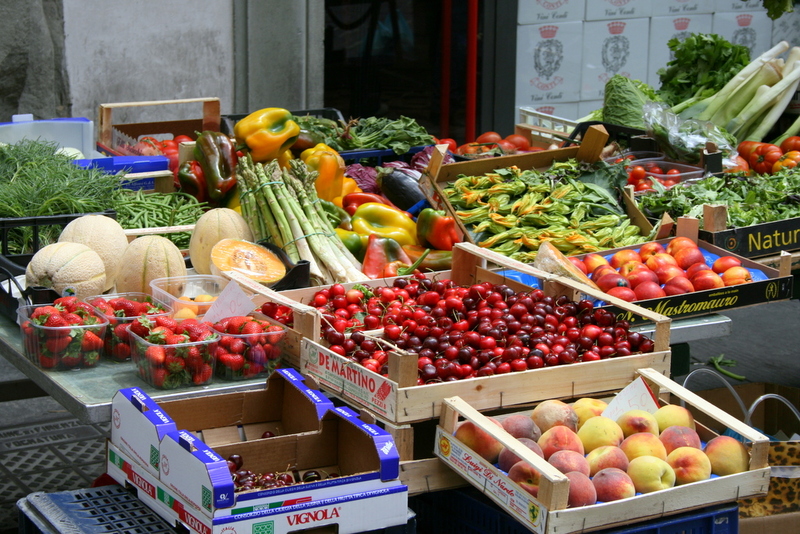 A driver will return you to the San Lorenzo market, or directly to your villa near Florence. Cost: 90 Euros per person. Minimum 4 people. Maximum 7 people. Transportation and lunch (including wine) are included. Free pick up/drop off applies only to villas that are within a 20 km radius of Florence. 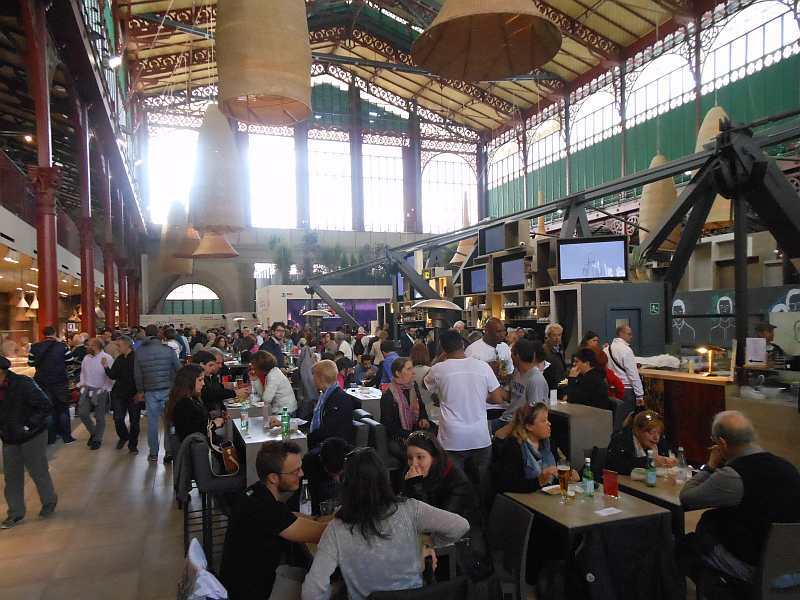 For an additional cost, wine tasting in the San Lorenzo Market can be arranged. Plan an evening to remember at this historic jewelry shop in Cortona! 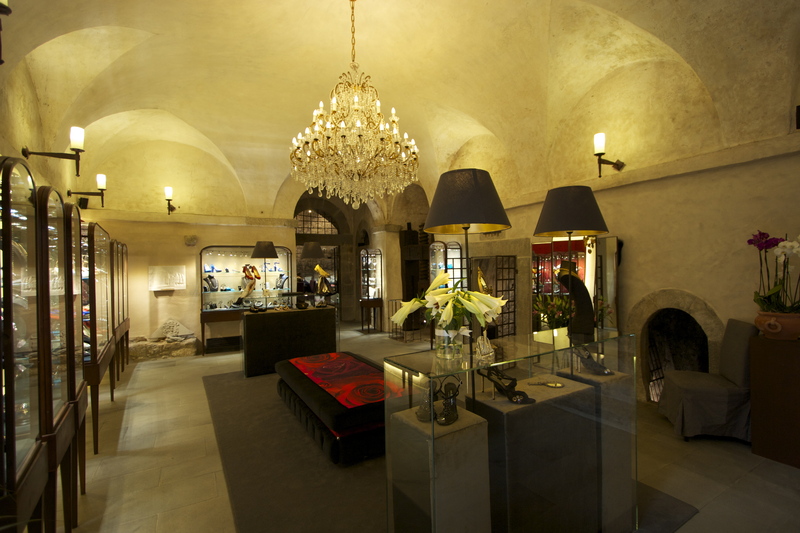 Overview: Enjoy a private, gourmet tasting dinner in a magical setting–an exclusive artisan jeweler’s shop in Cortona. Your special evening includes private access to the historic show room (which is also comprised of a cigar room and dining room) and handcrafted gold and silver jewelry. Handmade shoes are also on display. Guests will be treated to a jewelry-making demonstration. The meal includes an aperitif with gold and silver flakes and gourmet tasting dinner. 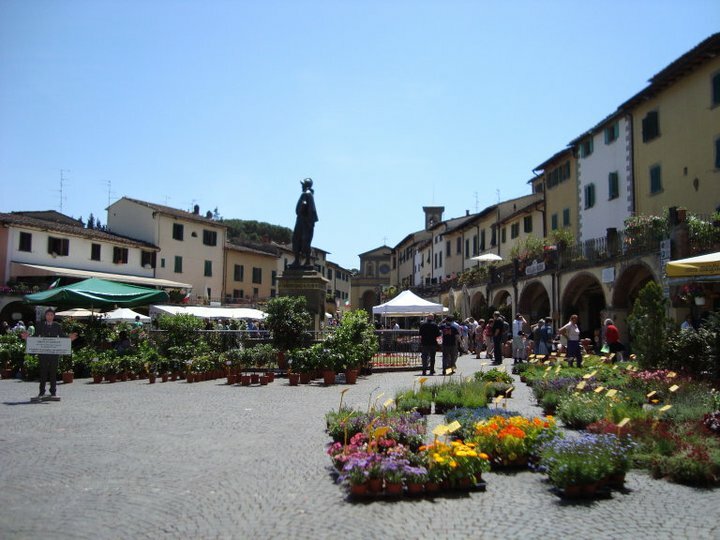 You will meet the Jewelry Tour Guide in the Cortona Main Square. Transportation to/from Cortona may be arranged for an extra cost. Cost: 210 Euros (2-3 pax); 139 Euros (4-5 pax); 112.50 Euros (6-7 pax); 98 Euros (8-20 pax). Children are welcome, but adult rate per child applies. Note: wine is not included in the price. 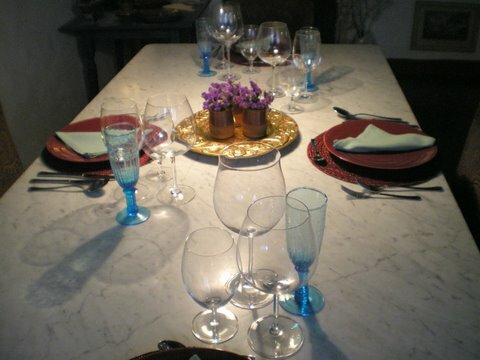 Enjoy dinner at the home of a Tuscan winemaker! 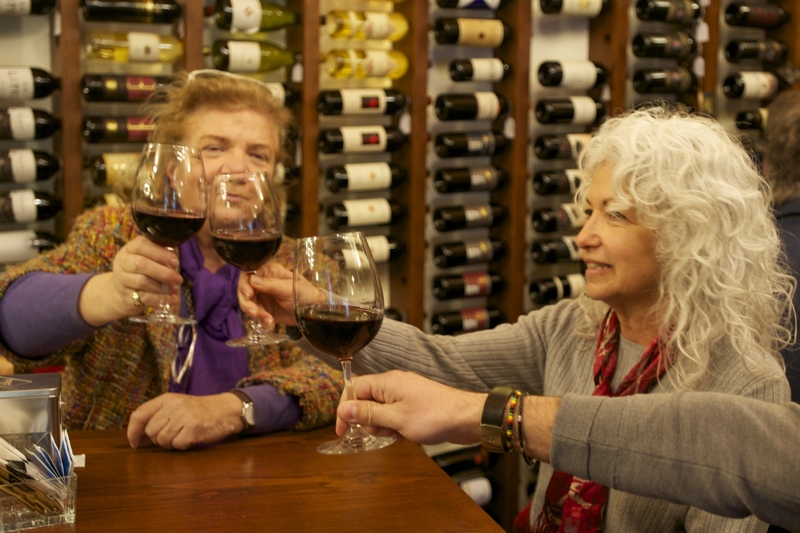 Overview: Experience firsthand the harmonious relationship between Tuscan food and wine. Enjoy a chef-prepared dinner and wine pairings at the home of a local organic winemaker, located between Montepulciano and Chianciano Terme. During the meal your host will share his passion for wine and describe each pairing. Sample menu includes: a Tuscan appetizer with chicken liver paté and bruschetta with organic extra virgin olive oil paired with Somaio Bianco IGT 2013; a first course of handmade tagliatelle with Tuscany ragù paired with Vino Nobile di Montepulciano DOCG 2011; a second course of grilled sliced steak with rocket salad and parmesan accompanied by a side dish of Tuscan white beans–both paired with a Riserva di Vino Nobile 2008; and classic tiramisú for dessert. Cost: 112.50 Euros per person (minimum 4 people). 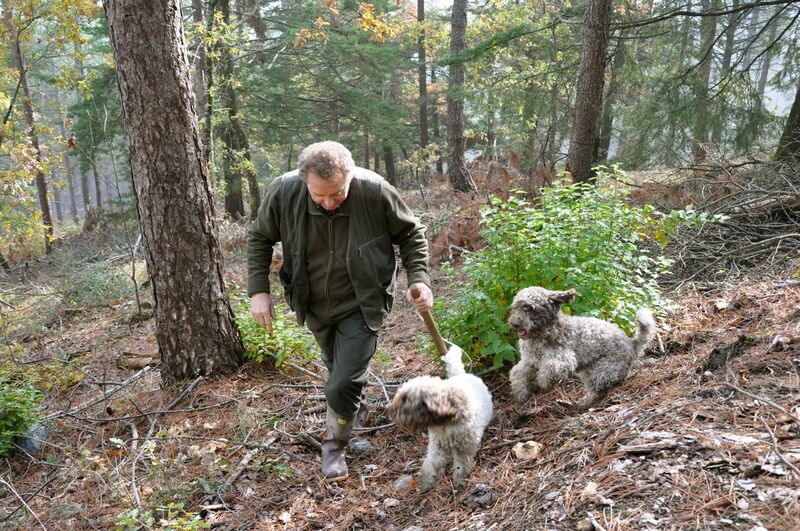 A Tuscan truffle hunter and his trusty hounds on the scent. Overview: Join truffle hunter Giulio and his truffle hound Edda on a hunt for black truffles. After your time in the woods, you’ll proceed to Bagno a Ripoli (near Florence) for a delectable lunch in Giulio’s Tuscan kitchen featuring truffles in each course. A local Sangiovese will be served with lunch. Available weekdays during March-December (except May) (10 AM – 2 PM). Cost per person: 130 Euros (4-5 pax); 120 Euros (over 5 pax). Transportation not included. Note: Scroll down to the bottom of the page to read a customer review of The True Truffle Experience! Enjoy an evening of wine tastings paired with local fare highlighting truffles in Bagno a Ripoli (near Florence). Taste four different Tuscan wines (all produced by friends of your host, Giulio) and savor light Tuscan fare such as local prosciutto and salame, olives, garden salad, and frittata with truffles. 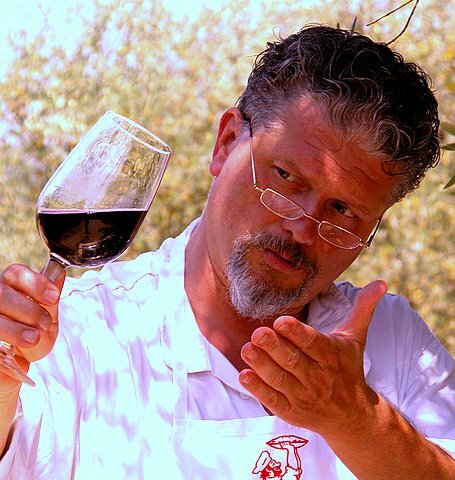 Giulio, your host and guide, will discuss the wines and truffles and share insight into regional food culture. Complete the meal with homemade dolci. Available Monday-Friday March-December (except May). Cost per person: 90 Euros (2 pax); 85 Euros (2-5 pax); 75 Euros (more than 5 pax). Transportation not included. My husband, Paul and I, would like to formally thank you for offering the “True Truffle Experience” to your clients. Never in our wildest dreams did we ever think that we would go on a truffle excursion while vacationing in Italy. Not only are we true foodies, but we are also morel mushroom hunters. This is an experience that we will certainly never forget, and one that we will share will family and friends for a lifetime to come. We had been in contact with Giulio prior to leaving for our trip. His emails were very helpful and his directions were very easy to follow from our villa. Upon our arrival, we were greeted by him and his lovely partner, Christina, at their beautiful estate La Limonaia. They were very welcoming and spoke great English. Giulio presented us with an overview of the evolution of truffles as well as his credentials. The knowledge and passion that he has can be seen by a certain twinkle in his eye whenever he speaks of the truffles. We were pleasantly surprised to have an impromptu olive oil tasting. We definitely learned a lot and have expanded our pallets. Unfortunately, we are now spoiled with Tuscan olive oil, and we will probably never be able to use anything else! When it came time for the actual “hunt”, we first had to meet his partner in crime. Etta or Edda, is his beautiful hunting companion. The very key to a successful truffle experience. After she happily responded to us, we loaded into his car and drove up into the hills. From up top, we had the most amazing view of Florence. We quickly headed into the woods and followed 10 steps behind the hunting duo. Not knowing what to expect, we were very surprised to have found a black truffle 15 minutes into our hunt. We continued up the hills and through the woods for over an hour. The end result was 5 truffles! When we returned to his estate, we were shown the correct way to clean the truffles. Christina then prepared a phenomenal potluck of dishes that were blessed with a generous amount of truffle shavings on top. My husband and I still talk about her Tuscan white bean soup. She is as gifted in the kitchen as he is in the woods. 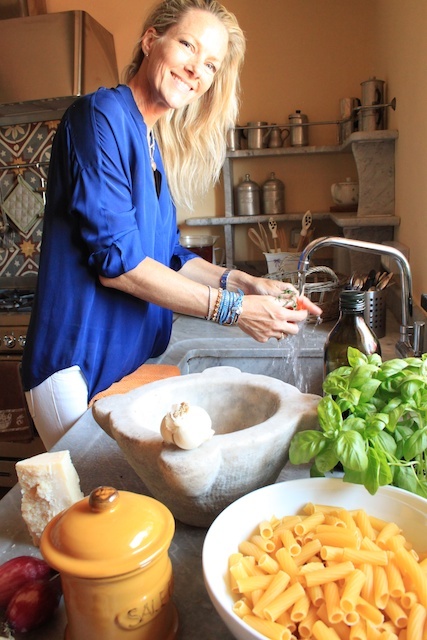 In fact, on our next visit to Tuscany, we want to do the truffle experience again as well as a cooking class with her. We were very sad to say our goodbyes. It was as if we were leaving old friends. The only satisfaction we had was knowing that we will meet again. This was definitely one of the highlights of our whole Italian experience. Please contact RentVillas at (800) 726-6702.To confirm a reservation, a 20% non-refundable deposit is required. Upon receipt of the deposit, you will be put in direct contact with the Cook or Tour Guide, who will be able to answer your specific questions regarding the details of the meal and/or tour, including balance payment, extra costs, and the meeting time and place. We recommend that reservations be made at least two months prior to your departure.